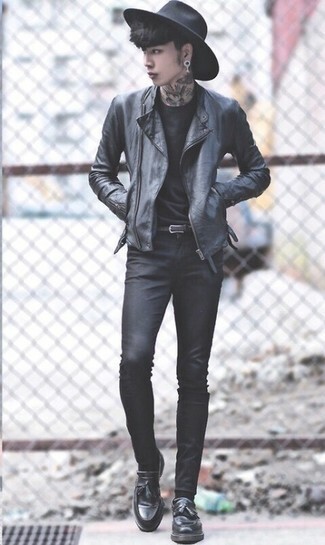 If you prefer relaxed dressing when it comes to your personal style, you'll love this stylish pairing of a Paul Smith Ps Leather Biker Jacket and black skinny jeans. Black leather derby shoes will bring a classic aesthetic to the look. 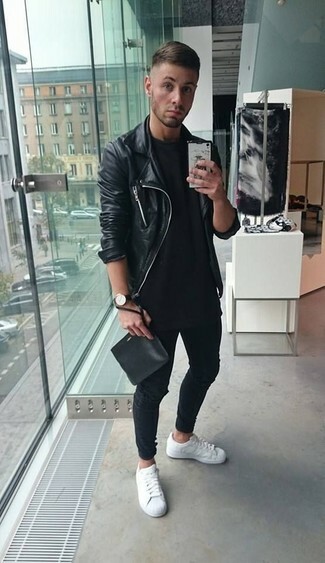 If you're in search of a casual yet on-trend look, make a Paul Smith black leather biker jacket and black jeans your outfit choice. As well as super comfy, both of these garments look great together. 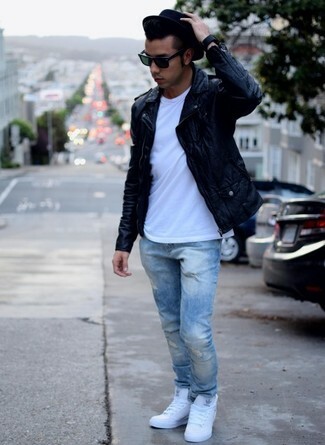 Round off with white leather low top sneakers and off you go looking smashing. 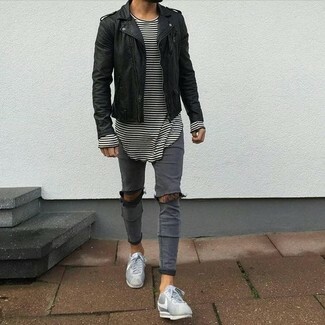 Pair a black leather biker jacket with grey ripped skinny jeans, if you want to dress for comfort without looking like a slob. Bring instant interest and excitement to your look with grey low top sneakers. 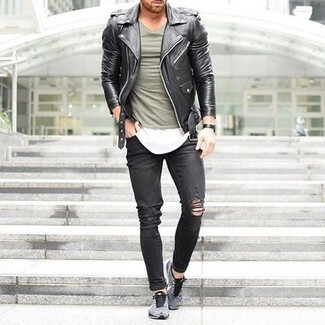 If you're all about relaxed dressing when it comes to your personal style, you'll love this on-trend pairing of a black leather biker jacket and black ripped skinny jeans. As for the shoes, go for a pair of grey athletic shoes. If you're on the lookout for a casual yet seriously stylish getup, dress in a Paul Smith black leather biker jacket and light blue jeans. These two items are totally comfy and they also look incredible when worn together. Add a sportier vibe to your outfit with white high top sneakers. If you're after a casual yet dapper ensemble, opt for a Paul Smith Ps Leather Biker Jacket and tobacco chinos. These garments are totally comfortable and look wonderful when paired together. 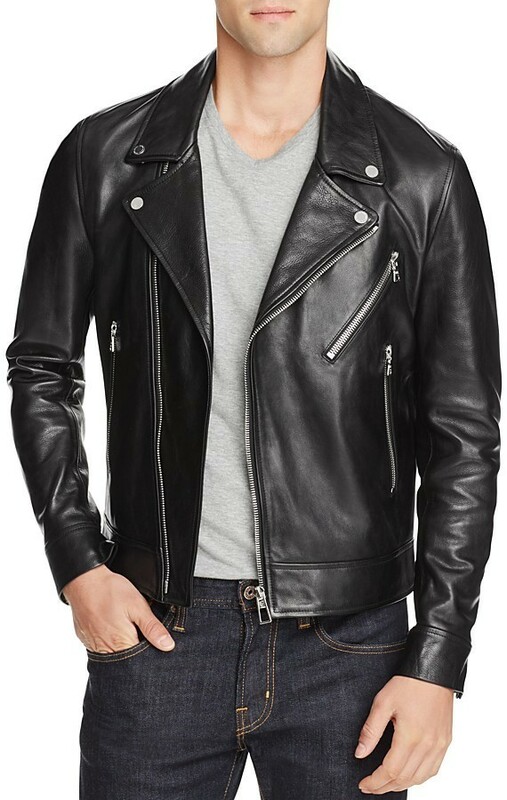 Consider pairing a Paul Smith Ps Leather Biker Jacket with black skinny jeans, if you feel like relaxed dressing without looking like a hobo. You could perhaps get a little creative when it comes to footwear and dress up your getup with black leather tassel loafers. If you're on the hunt for a casual yet dapper outfit, wear a Paul Smith Ps Leather Biker Jacket with navy jeans. As well as super comfortable, both pieces look great when paired together. 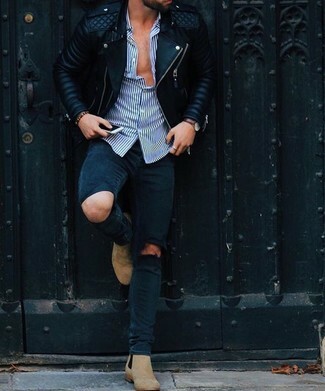 If you prefer comfort dressing when it comes to your personal style, you'll love this stylish pairing of a Paul Smith Ps Leather Biker Jacket and navy ripped skinny jeans. Wearing a pair of beige suede chelsea boots is an easy way to add some flair to your look.